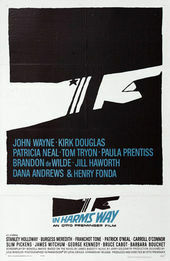 Author Pat Kirkham discusses the closing credits of Otto Preminger's In Harm's Way designed by Saul Bass, from her authoritative book Saul Bass: A Life in Film and Design. Preminger's sprawling two-and-a-half-hour wartime melodrama follows a naval troop from just before the Japanese attack on Pearl Harbor to the end of World War II. Saul's metaphorical epilogue is evocative of the “violent and eternal qualities of the sea.” It connects the broad historical sweep of the ﬁlm and the violence of war with the volatile cycles of nature. Using images of water, waves, storms and explosions, Saul created a powerful montage. Tension builds, from beautiful gentle waves against a beach to stormy seas and enormous explosions that seem to grow out of the sea itself. Finally, the sea calms again to reveal the moon's reﬂection on gently lapping waves.